Vuillard painted a small number of self-portraits; one of the first includes a sketchy portrait of his friend Waroquy and another is an intriguing painting of the artist kissing a girl more likely to be one of his mother's seamstresses than his sister, as was initially thought, but in nearly all the rest he appears on his own, isolated from the small group of family and friends he documented so obsessively throughout his life. The present painting is possibly unique in its subject, a self-portrait in which the artist also detaches himself from his own self-representation to explore his role in relation to the two women that dominated his life and his painting, his sister and his mother. The famously complex relationship between these two is documented in many paintings and one of the most interesting aspects of this work is the manner in which at first it appears to subvert the usual depiction of the two women, while ultimately reinforcing it. Madame Vuillard is a dominating force in almost every painting in which she appears, often a solid pictorial bulk as much as a description of an individual. Occasionally Vuillard allows glimpses of a more genial and relaxed figure, but usually only in works where she is on her own and being painted or drawn by her favoured son. In Le Petit Dejeuner, for example, Marie seems almost to cower before her mother as she leans across the table, while in Interior - Mother and Sister of the Artist (1893) the power of her squat, dark mass seems to push Marie against the wall, where she fades into the patterned wallpaper. In Self-Portrait - The Vuillard Family, Marie has adopted the pose of her mother in the 1893 Interior and in Mother and Daughter Against a Red Background (c.1891), yet the effect is quite different. By now, she has become a married woman, while her mother has grown older, yet Marie seems constrained here between mother and son, as if in trying to assert herself she is becoming suffocated. Madame Vuillard is a shadowy figure, almost vanishing into the patterned clothing that plays such a metaphorical role in Vuillard's art. While this figure has not previously been identified, it seems unlikely to be anyone else. Not only is Marie rarely painted alongside the more fashionable friends who dominate Vuillard's work at this time, but it would be strange for Vuillard to make a point of showing himself and his sister in such a cramped, claustrophobic arrangement alongside another sitter when he had probably never previously painted himself with Marie. In terms of the narrative and dynamic of the painting, this third figure can only be the artist's mother. In addition, a number of drawings of Madame Vuillard in the 1910s and 1920s show her wearing a bonnet similar to that worn by the third figure in the present work and on various occasions she is drawn in profile, bearing a close resemblance to the profile here. Vuillard's photographs also contain images of Madame Vuillard in similar poses to this, including one photograph of Vuillard and his mother almost in profile taken in 1910, around the time of this painting. Intriguingly, as Madame Vuillard grows older, her son depicts her less centrally and more frequently in profile in his work yet, despite this suggested physical diminishment, this rarely brings about any lessening of the sense that she remains the controlling figure within her family. Photography does appear to play a crucial role in this painting. Vuillard, Misia Natanson and Suzanne Avril are photographed in 1899 in an almost identical pose and around 1900 Vuillard arranged individual portraits of himself, his mother and his sister in a manner sufficiently deliberate to suggest that this complex portrait was already in gestation. It is unlikely that much, if any of this painting was worked from life and photographs are a probable source used to reinforce his imagination. The date of c.1910-12 appears to be judged on stylistic grounds, although connections could be made with some paintings from the very end of the previous century. The painting was not exhibited during the artist's lifetime and almost certainly evolved as a deeply private work never intended to be shown. Its complex and inventive execution suggests it was some time in the making and the photographs taken around 1900 might have marked the initial conception of the work. Certainly it is one of the most psychologically revealing of all Vuillard's work. The sitters occupy a shallow space that tilts forward and is held in awkward balance by the sketchily described room behind them, the curtains, the patterned wall and a small marble-topped table with objects placed behind the artist's right shoulder. Vuillard's hands are clasped on his knee, setting up a pictorial link with his sister which is negated by everything else in the painting. 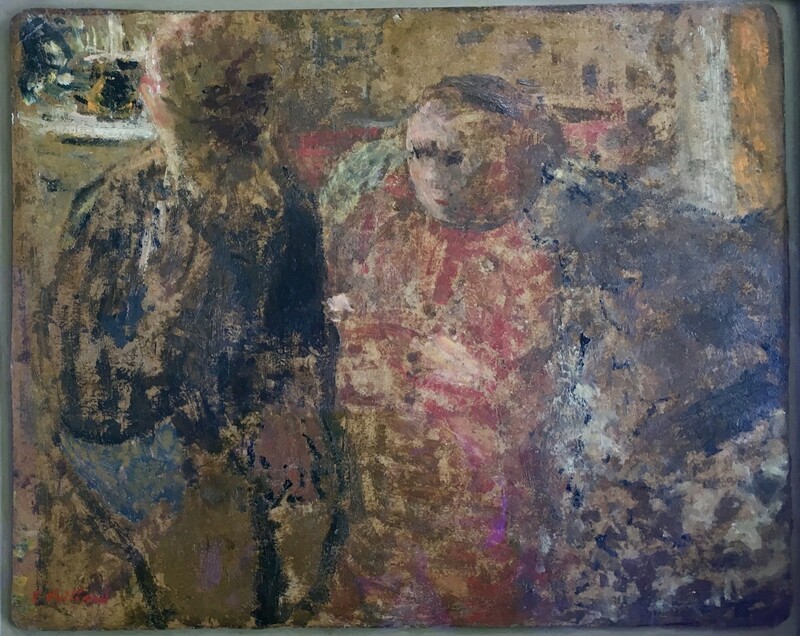 Tonally, Vuillard and his mother are related while Marie is left isolated in her reds and browns; the artist appears to be looking across her and towards his mother. Marie has the solid pose recognisable from earlier portrayals of Madame Vuillard, but she is hemmed in between the closeness of mother and son. Her gaze is edgy and directed away from the others and out of the painting, while her hands nervously seem to hold a piece of material. The honesty of the painting is remarkable. Vuillard shows himself as a physically insubstantial figure dependent on his mother. He creates a claustrophobic and psychologically damaged interior world, where the elusive Madame Vuillard at first appears to have lessened her control over her married daughter and her professionally successful son but, in reality, Marie is still the intimidated girl we know from the paintings of the early 1890s. Vuillard and she appear to share little affection and they are both still subjugated by their mother. This depiction of Madame Vuillard is little more than a distinctive profile and a cleverly realised accumulation of marks describing her clothing and cap, but as we look more at the painting her power is slowly revealed. The exceptionally restrained and subtle manner of painting allows much to rest on implication and suggestion. The loose general description of physical appearance allows the psychological dimension of the work to take precedence and to make us realise the true implications of the artist imagining such a scene. As probably the only painting in which Vuillard took on this intensely private subject, this self-portrait suggests a reluctance to put these facts down in such a permanent manner; the minimum is described but each element of the painting retains enormous emotional truth and force.